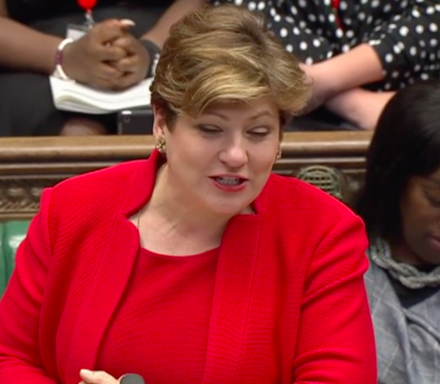 Emily Thornberry was deputising for Jeremy Corbyn today at prime minister’s questions, and she well and truly brought her A game to the chamber. She was sharp, and she resolutely pushed those issues she wanted to push. Instead of a comfort blanket list of fully planned questions, she was responsive and witty — but without letting the humour cut across the seriousness of her questions. The shadow foreign secretary focussed on the PMs pre-election comments, in which she suggested that no deal was an option that the government would accept, on the grounds that it would be better than a bad deal. Of course, no deal would mean a hard border returning to Ireland — an unbelievably risky possibility. But, with the Tories willing to risk peace in Northern Ireland to continue governing, perhaps it should come as no surprise that they would risk a hard border in their ideological pursuit of a hard Brexit. “The first secretary apparently didn’t get the prime minister’s memo: you’re supposed to be building consensus, man! And if we ignore the political bluster, I think what we heard is that no deal is indeed still an option,” Thornberry quipped in response to Damian Green’s answer to her questioning. She moved onto the issue of Anne Marie Morris, the Tory MP who has now had the whip withdrawn because of her use of the N-word. Thornberry referred to the incident as “the East India club question”, because that is where Morris was speaking when she made the racial slur. Thornberry was making a broader point, since the East India Company, which ruled India in much of the 18th and 19th centuries, was a byword for colonial exploitation. Backbencher Caroline Flint started off the session with a question on fair energy prices, urging the government to provide rebates for households that have been overcharged. Green pointed to the policy in the Queen’s Speech, itself borrowed from Ed Miliband. Dan Jarvis, Labour MP for Barnsley Central, asked about organ donation, highlighting the sad case of a young constituent who is waiting for a heart transplant. Jarvis is pushing for an opt-out donation system — which would dramatically increase the potential pool of donors. “Since the introduction of an opt-out system in Wales, the pool of potential organ donors has almost trebled. It makes sense to do the same in England,” he said. Rupa Huq, following the prime minister’s request for assistance from the opposition benches, added her own idea in her question. The Ealing Central and Acton MP suggested the adoption of page 43 of the Labour manifesto — which she had helpfully brought along — where Labour proposed an end to tuition fees. In his non-answer to Huq, Green misgendered Angela Rayner, referring to the Labour’s education spokesman, seemingly forgetting that she is indeed a she. Rayner took issue with the presumption — quite rightly. Green pointed out the financial implications of the policy, which as an argument seemed somewhat lacking. Of course it would cost money. Overall, while not the most significant prime minister’s questions that the Commons has ever seen, Thornberry and all on the Labour benches pushed our messages well, and held the government’s feet to the fire on its failing record. The shadow foreign secretary is certainly no slouch when it comes to parliamentary theatre and powerful rhetoric, and she further proved that today.